Work brought me to the exciting city of Omaha, Nebraska this week. Such a colorful place. Krazy Kory is also in sales and covers Nebraska as well, so we happened to both be in town at the same time. We connected for lunch and some pre-sales call pep talks to motivate each other to go out and make it happen. Which we did. 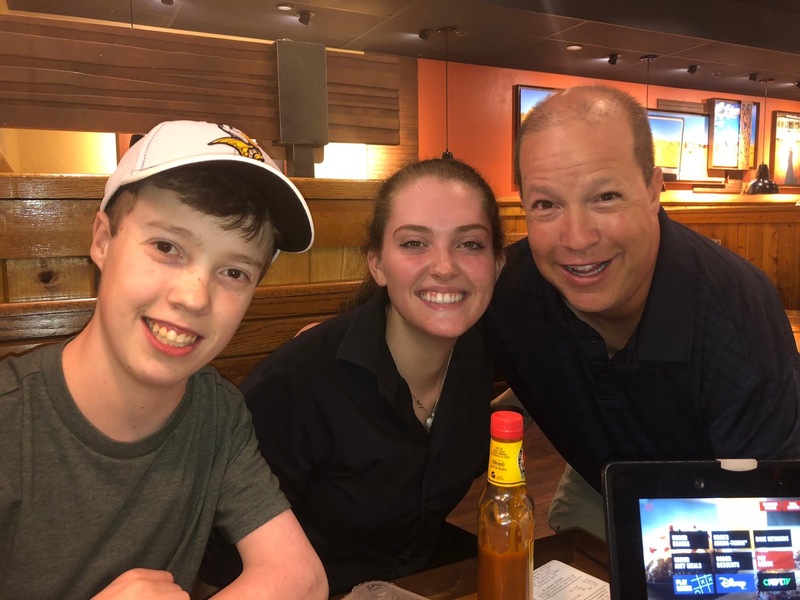 Luke came home from college for a quick visit so we took him to one of our favorite restaurants, The Outback. Our waitress, Maddie, was a bunch of fun and ended up hanging out with us throughout the night. We love waitresses like this! We are in the process of re-modeling one of our bathrooms and found ourselves at The Tile Shop in Burnsville to make some selections. Bryan was our salesperson and was very helpful for us in making our choices. If you're in the market and in the neighborhood, I'd recommend him wholeheartedly. On Saturday, we headed to the St. Croix River for one of our last boat rides of 2018. The weather is getting cooler and the water temperature is down to 65 degrees already. Where did summer go? Captain Karl was ready to take us for a joy ride. It was us, the Zitzewitzes, and the Browns ready to go for our 3 hour cruise. We had a special treat in that Tina's mom was also there for the weekend and she makes boat trips extra fun! The guys stayed up top while the ladies remained down low. Not sure if there's any significance to that, but it's just the way it worked out. Is that a chimney on your shore or are you just excited to see me? Our destination was Mallards Restaurant and Lounge in Bayport. Miss Sheri and I hadn't been there before, but Karl and Tina really liked it so we looking forward to checking it out. I was surprised later in the evening when the waiter brought me a drink and told me it was from a gentleman at the bar. I asked if he was trying to pick me up or something and he said he didn't know. So I wandered up there and found one of my longtime customers from Nor-Tech, TJ Hoffman. It was great seeing him! We thoughts Mallards was great. They claim to have the best seafood and Cajun food in the Twin Cities. I had the Jambalaya and thought it was really good, so I guess I wouldn't argue with their claim. Good times.